Brown, Michael D.; Hosseini, Seyed H.; Torroni, Antonio; 等. mtDNA haplogroup X: An ancient link between Europe/Western Asia and North America? (PDF). American Journal of Human Genetics. December 1998, 63 (6): 1852–1861. PMC 1377656. PMID 9837837. doi:10.1086/302155. Fernández-Armesto, Felipe. Before Columbus: Exploration and Colonization from the Mediterranean to the Atlantic: 1229–1492. University of Pennsylvania Press. 1987. ISBN 0-333-40382-7. Schurr, Theodore G.; Ballinger, Scott W.; Gan, Yik-Yuen; 等. Amerindian mitochondrial DNAs have rare Asian mutations at high frequencies, suggesting they derived from four primary maternal lineages (PDF). American Journal of Human Genetics. March 1990, 46 (3): 613–623. PMC 1683611. PMID 1968708. Wright, Ronald. 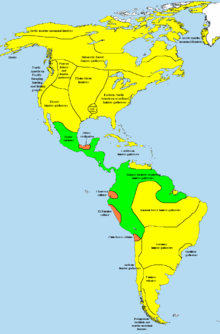 Stolen Continents: 500 Years of Conquest and Resistance in the Americas. Houghton Mifflin. 2005. ISBN 0-618-49240-2.